Blue Peter is celebrating 60 years with a big birthday extravaganza on 16 October 2018 live from The Studios at dock10, to celebrate 60 years and over 5,000 shows we bring you 60 facts for 60 years of this record breaking show. 1. Blue Peter first aired on 16 October 1958 and transmitted for 15 minutes. 2. The first presenters were Christopher Trace and Leila Williams. Christopher Trace was the stand-in for Charlton Heston in blockbuster Ben-Hur and Leila Williams had been crowned Miss Great Britain the previous year. 3. Blue Peter was created by John Hunter Blair. Throughout the programme's 60-year history, there have been just seven editors: Biddy Baxter, Lewis Bronze, Oliver Macfarlane, Steve Hocking, Richard Marson, Tim Levell and the current editor Ewan Vinnicombe. 4. The 60th anniversary edition of the show on 16 October will be programme number 5,037. 5. 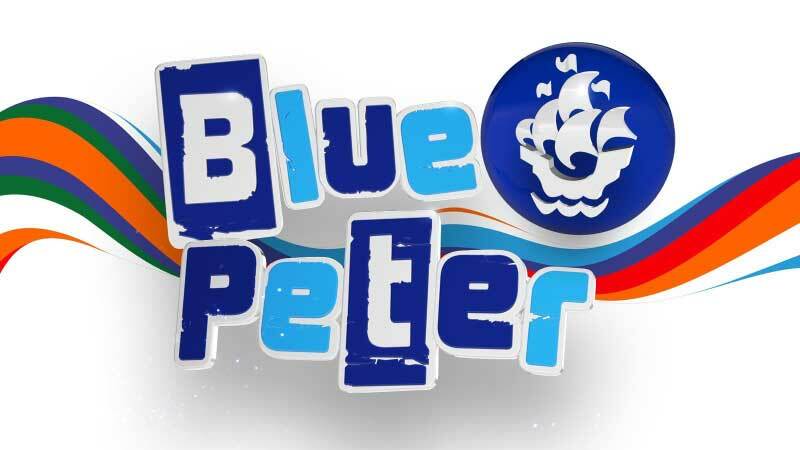 Blue Peter is named after the blue and white flag hoisted when a ship is ready to set sail from port. The reasoning for the choice is that the programme is intended to be a voyage of adventure and discovery for the viewers, constantly covering new topics. 6. The ship's symbol, the Blue Peter Galleon, was designed by much-loved TV artist Tony Hart, who received just £100 for his work - which is worth an estimated £1,537 in today's money. Had he been paid royalties they would have made him a millionaire. 7. The theme tune is called Barnacle Bill. There have been eleven versions of the theme tune and the latest arrangement was created by British composers Banks & Wag. In 2018 David Roocroft was asked to compose a special 60th Birthday arrangement. 8. There have been 37 Blue Peter presenters, including current presenters Lindsey Russell and Radzi Chinyanganya, who both started in 2013. 9. The longest-serving presenter was John Noakes, who presented the series for 12 and a half years. The longest-serving female presenter was Konnie Huq who presented the series for just over a decade. 10. Peter Duncan is the only presenter to do two stints on the show. He became a Gold badge holder after he was made Chief Scout in February 2007. 11. Yvette Fielding was the youngest-ever presenter. She was 18 when she joined the series. 12. The shortest-serving listed presenter was Anita West, who lasted for just four months before returning to her acting career. 13. Lindsey Russell is the only person to become a Blue Peter presenter in a nationwide talent search. She became the 36th presenter of the series after thousands of children selected her in a viewer vote in July 2013. 14. The famous Blue Peter badge was launched on 17 June 1963. 15. There are eight types of badges - Blue, Silver, Green, Sport, Purple, Orange, Gold and Diamond. Blue can be earned by viewers sending in an interesting letter, poem, picture or story, or by appearing on the programme. Silver is for viewers who already have a Blue but have to do something different to earn one. Green is the environmental award, for viewers who make contributions on "green" subjects. Sport is for children who take part in a new sport. Purple is awarded to children who take an active role in the show, either by reviewing it, suggesting ideas for items or helping with audience research. Orange is given to viewers who have been either a winner or runner-up in a Blue Peter competition. The Gold badge is Blue Peter's highest award and is only given to people who have shown outstanding bravery, courage and expertise or have represented their country in an international event. Introduced in 2018, the Diamond badge was designed by International fashion designer Henry Holland and is a limited-edition badge to celebrate Blue Peter's 60th Anniversary. 16. Famous Gold badge holders include Her Majesty The Queen, who received one in 2001 and the Duke and Duchess of Cambridge, who received theirs in 2017. David Beckham, JK Rowling, Mary Berry, Usain Bolt, David Attenborough, Tim Peake, Malory Blackman and the RAF Falcons have also earned Blue Peter's most sought after award. Roald Dahl was to be the first person in the show's history to be posthumously honoured with a Gold Blue Peter badge in 2016. 17. In 55 years of the badge scheme it is estimated that the programme has awarded over a million badges. 18. Every guest who comes on the show earns a badge. Celebrities with badges include: Hugh Jackman, Tom Hiddleston, Eddie Redmayne, Jessica Ennis-Hill, Ellen Degeneres, Maisie Williams, Madonna, Britney Spears, Ewan McGregor, Justin Bieber and Morph. 19. Since 2017, Blue Peter's plastic badges have been made out of recycled yoghurt pots in a solar-powered factory in Cornwall. 20. A Blue Peter badge and Badge Card gets children of 15 years and under free admission into over 200 venues up and down the country. 21. Blue Peter's pets are almost as well-known as its presenters. There have been nine dogs, five tortoises, nine cats and two parrots. 22. George the tortoise is the longest-serving pet. He made his first appearance in 1982. When he died in 2004 he was around 81 years old. The current Blue Peter tortoise is Shelley who has been on the show since the spring of 2004. 23. In 1962, a lady named Margaret Parnell sent in the idea for the first Blue Peter "make" and spent the best part of the next 40 years creating them, designing over 700. 24. Early makes include the classic Christmas Advent crown, which was supersized in 2017, and is used annually to count down the weeks until Christmas in the studio. More recent makes include a Blue Peter Pop Up Christmas card with popstar Anne-Marie, Big Birthday Balloon Biscuits to support the launch of Blue Peter's Big Birthday Balloon competition where one lucky viewer was given the chance to design Blue Peter's 60th Birthday Hot Air Balloon, a Shelley the Tortoise beanie and even Emoji Poo Cookies! 25. The most popular make was Tracy Island, which received 100,000 requests for the Factsheet in 1993. Anthea Turner still has the Tracy Island she made on the show. 26. The Blue Peter Appeals started in 1962 when viewers were asked to collect postage stamps to raise money for homes for the homeless. 27. It's estimated that, across the 49 appeals, children have raised the equivalent of over £100m in today's money. The 14 Bring & Buy Sales have raised the equivalent of an estimated £57m. Other items collected by the appeal include over 948,025,000 stamps, 19m aluminium cans, 800 tons of wool and over 1,450,000 pairs of shoes, including David Beckham's boots. 28. Between 1962 and 2010 the appeals have raised money to buy, amongst others, the following: 2 Guide Dogs, 25 Life Boats, 8 flats for homeless people, 32 ponies, 57 lorries, 3 caravans, 2 day centres, 6 bungalows, 12 houses in Romania, 3 schools and 8,350 toilets. In recent years, Blue Peter has supported Sport Relief. In 2010, Helen Skelton kayaked 2010 miles down the Amazon river for Sport Relief, achieving two Guinness World Records and in 2012, she completed a 500-mile trek to the south pole on skis, kite skis and an ice bike for the charity. In 2016, Lindsey Russell became 'The Wave Runner' as she attempted to cross the Irish Sea three metre inflatable ball. In 2018, Lindsey and Radzi completed a mega mile-athon encouraging children to do over 80 million steps for Sport Relief. In 2011, Helen Skelton walked a 150m long, 66m high tightrole between the chimneys of Battersea Power Station and in 2017, Barney Harwood travelled hundreds of miles to tell a joke to as many people as possible in just one day in a Blue Peter 'Jokeathon' for Sport Relief. Over the last five years, over 23,000 children have pledged to support Children in Need via Blue Peter 'send ins'. They have decorated colourful parachutes, superhero pants, masks and goo splats! In 2017, Mark Curry won the Blue Peter Strictly Come Dancing Special for Children in Need on BBC One. Many Blue Peter presenters over the years have faced the ultimate Blue Peter challenge - training with the Royal Marines! Simon Thomas tackled the dreaded Royal Marines Tower Bridge death slide, Matt Baker tried his hand at the Royal Marines' recruits course and Konnie undertook a Royal Marines' P.E. class in the mud of the River Exe. Gethin Jones was the first civilian to complete the 30-mile Yomp of the Royal Marine Commandos. In 2013, Helen Skelton attempted the 30 mile speed march which is the final test done by troops attempting the Commando course at the Royal Marines training centre. In 2016, following in the footsteps of Blue Peter presenters John Noakes, Janet Ellis, Stuart Miles and Simon Thomas, Radzi Chinyanganya became the latest Blue Peter presenter to free fall with the RAF Falcons for Children in Need. Christopher Trace, Michael Sundin, Katy Hill, Gethin Jones, Helen Skelton and Lindsey Russell have all flown with the RAF's aerobatic team, the Red Arrows. In 2018, Radzi Chinyanganya learnt how to become a tank commander at Bovington camp. Blue Peter has funded 28 RNLI Lifeboats at 7 different stations across the UK, saving over 1,040 lives. A Blue Peter lifeboat is still rescuing people today - at Fishguard lifeboat station. Blue Peter has a long standing association with Guide Dogs for the Blind, which stretches back to 1964. The first Blue Peter Guide Dog puppy was Honey, whose training was followed by Valerie Singleton. Subsequent Blue Peter Guide Dogs include Cindy, Buttons, Prince, a second dog named Honey, Magic and Iggy! Goldie the dog was donated by the Guide Dogs' For The Blind Association in May 1978 and lived all her programme life with presenter Simon Groom. Goldie left Blue Peter - along with Simon - in the summer of 1986 and her daughter Bonnie took over in the studio. Nine of Goldie's pups became Guide Dogs. Magic the Guide Dog became a star of Blue Peter in October 2006. Andy Akinwolere embarked on the challenge of helping puppy walk her but sadly Magic developed health problems in late 2007 and failed to complete further training. Iggy joined the Blue Peter team in June 2014 and was puppy trained by presenter Lindsey Russell. She qualified training in 2016 and was partnered with Bradford student and service user, Callum. 37. The Blue Peter Garden was launched on 21 March 1974. Percy Thrower was the first gardener and was awarded his Gold badge in 1988. The second gardener was Chris Crowder, followed by Clare Bradley and Chris Collins. The garden has been more recently been maintained by RHS Young Ambassador and Young Gardener of the Year 2014, 12 year old George. 38. The Blue Peter Garden at Television Centre was vandalised three times - in 1978, 1980 and 1983 - before security cameras were eventually fitted. The garden, in its new home in Salford, was opened in February 2012 by HRH Princess Anne. It consists of a bronze statue of Petra, the show's first pet, a vegetable plot, silver Blue Peter galleon and the Italian sunken garden designed by Percy Thrower. In 2017, Blue Peter launched its milestone 60th year with the addition of a Gold Badge Walk - a path to honour some of the well-known names who've received the special accolade, including Mary Berry. 39. In 1968 it was decided that Blue Peter would feature a baby on the programme, to show viewers what it was like to have a little brother or sister. On 30 September of that year, baby Daniel made his first appearance at just 14 weeks old and made regular appearances over the next two years. Peter Purves and John Noakes were given the job of looking after baby Daniel onscreen. 40. Presenters who had babies during the time they worked on the programme were Tina Heath, who had Jemma, and Liz Barker who had Dexter. 41. Peter Purves attributes the blame for Lulu the incontinent elephant to Editor Biddy Baxter, who allegedly asked Lulu's keeper to do without the stick he used to keep her under control. The ensuing chaos saw Lulu pee, poo and generally misbehave around the studio, dragging her gamekeeper through the mess. 42. Other memorable moments include Simon Groom's innuendo-laden: "What a beautiful pair of knockers", when commenting on a replacement for Durham Cathedral's historic door knocker; Mark Curry knocking the head off a Lego model, Diane-Louise Jordan falling flat on her face whilst covering John Leslie's run in the London Marathon and Andy Akinwolere accidentally dropping the star off the top of the Trafalgar Square Christmas Tree. 43. A competition to design a frock for presenter Caron Keating solicited responses from 69,928 debut dressmakers. In 1981 a competition to design a Christmas stamp generated 74,000 responses, and a contest to design a character for Aardman Animations in 2006 attracted 47,268 budding Nick Parks. 44. Recent Blue Peter competitions have given lucky viewers the chance to go where TV cameras have never been before, inside MI5's Headquarters; design a poster that appeared in major underground stations across the capital; create an animation and show it to Steven Spielberg, design sporting mascots for the London 2017 Championships; have their name featured in Anthony Horowitz's latest Alex Rider book; have a prehistoric character animated by the famous Aardman Animations and design a dragon that will sit on the Great Pagoda at Kew Palace. 45. Children who appeared on the show and have gone on to be famous include: Formula 1 ace Lewis Hamilton and popstar James Blunt (then James Blount). Konnie Huq also appeared in 1989 with the National Youth Theatre before she went on to become the programme's longest-serving female presenter. Actor Jude Law performed behind her! Richard Deverell, a Controller of BBC Children's, appeared on the show in 1976 as part of a troupe of knitting scouts and Ewan Vinnicombe, the show's current Editor, was a Top Runner-Up in a Blue Peter Competition when he was six and a half. 46. Blue Peter has many Royal friends. A young Prince Edward visited Blue Peter in 1969 and, in 1970, Valerie Singleton and HRH Princess Anne filmed their Royal Safari in Kenya. Her Majesty The Queen visited the studio in 2001 and was given a Gold badge. In 2008, presenters Andy Akinwolere, Helen Skelton and Joel Defries and a specially selected number of former presenters and production staff were invited to the Palace to meet Her Majesty Queen Elizabeth II to celebrate Blue Peter's 50th anniversary. In December 2017, the Duke and Duchess of Cambridge visited the Blue Peter studios in Salford to celebrate Blue Peter's 60th birthday where they were each presented with a Gold Blue Peter badge. 47. There have been four Blue Peter time capsules. The first was buried at BBC Television Centre in 1971 and the second in 1984, when the first box had to be moved because of development at Television Centre. Another was buried in 2000, which will be opened in 2029. There was also one buried under the Millennium Dome in 1998 which was accidentally dug up by builders in 2017 - 33 years too soon! It has been touring around the UK before it is safely stored in The National Archives until 2050. The 2018 Diamond Time Capsule will also be stored in The National Archives until Blue Peter's 80th birthday in 2038. 48. Blue Peter is the longest-running children's TV series in the world and the programme and its presenters have earned themselves countless records. John Noakes's Long Fall gave him a place in the Guinness Book of World Records for the longest delayed drop by a civilian; Janet Ellis jumped 20,000 feet - a European record for a civilian woman; and Matt Baker's tandem hang-gliding also made the record books. Recent Guinness World Records achieved include most people limboing in 3 minutes by a team of over 25, most whoopee cushions sat on in 1 minute, most straws in hair and most people gunged in 3 minutes! 49. Blue Peter has won countless awards, including two Baftas, a National Television Award, an RTS Award, RTS North West Awards and the Sandford St Martin's Special Award. 50. If you sat down and watched every episode of Blue Peter ever made, back to back without any breaks, it would take around three months! 51. Although Simon Thomas made his first official appearance as Blue Peter's new presenter on 8 January 1999, he'd actually made a sneaky cameo dressed up as Father Christmas on the Blue Peter Christmas programme two weeks before. The team repeated this little 'in-joke' with Gethin, who also appeared as Father Christmas on the Christmas show four months before viewers met him properly for the first time in April 2005. 52. When Janet Ellis joined the programme, she was already mum to a little girl, Sophie. Over the next four years, Sophie appeared a few times on Blue Peter, on one occasion modelling a 'snood' which her mum was making. Sophie grew up to become pop star Sophie Ellis-Bextor and when she first performed on the programme the team invited her mum back to make a special surprise appearance. 53. The first colour edition of Blue Peter was transmitted on 14th September 1970 - but it wasn't the final time the programme was broadcast only in black and white. That came on 13th June 1974 - the last of a few occasions that year when because of pressure on studio space, Blue Peter was forced to transmit from a studio without colour cameras. 54. On 8 June 1989, Blue Peter's first outside broadcast transmitted from Carrickfergus Castle in Northern Island. Over the years, Blue Peter has broadcast from numerous iconic locations including: the Science Museum in London, the Eden Project, Crufts, Buckingham Palace, Warwick Castle, the Olympic Velodrome - and even a Blue Peter viewers' house! 55. The famous edition of Blue Peter in which Lulu the Elephant disgraced herself on the studio floor wasn't, as many people think, live. In fact, it had to be pre-recorded because there was no studio space on the planned day of transmission. No-one on Blue Peter ever likes pre-recording a show but on this occasion it was a stroke of luck because if it had been live, the much-repeated mayhem would have over-run into the news! 56. Blue Peter reads and responds to every single letter they receive - the office manage hundreds of items of mail each week. The show still resonates with children today, over 192,000 children (aged 6-15) have at least one Blue Peter Badge and more children are contacting the programme with their letters and pictures (even in this digital age) with 106,303 pieces of audience correspondence received in 2017 (compared to 40,000 in 2011). There were no celebrations to mark the programme's 10th birthday but for the 20th anniversary on 16 October 1978 the team presented a special programme with birthday cards, a giant cake and a special UK wide balloon release. All the presenters came back to join in the fun with the exception of John Noakes who, as he was shooting his latest Go With Noakes series, sent a filmed message instead. By a strange quirk of fate, the programme was directed by David Langford - who twenty years before as a celebrated child ballet dancer had been Blue Peter's first ever guest. In 1988 Blue Peter hit its third decade and on 17 October the team of the day presented their birthday tribute. It started with a giant electronic message board in London's Leicester Square flashing the words - "Blue Peter - 30 Years on the crest of the air". The presenters took part in a special mini play showing how life had changed in the thirty years since the programme had started and there were lots of birthday messages from celebrities. On 16 October 1998 Blue Peter was forty years old. To mark the anniversary all the show's previous presenters were invited to the Blue Peter studio for a special birthday edition full of games and quizzes. On the previous Saturday night BBC Two had devoted a whole evening to showing a highly successful Blue Peter Night. For the first time in 27 years Valerie Singleton, John Noakes and Peter Purves were reunited in a specially built replica of an early 70s Blue Peter studio to introduce a whole evening of programmes. On 16 October 2008, Blue Peter celebrated its 50th birthday with a special extended edition live from BBC's Television Centre. Her Majesty The Queen invited presenters past and present and key production staff to a special birthday tea at Buckingham Palace and during the event Her Majesty recognised four very special Blue Peter viewers by awarding them Gold Blue Peter Badges.